The Washington Post reported on 10 October 2018 that U.S. intelligence intercepted communications of Saudi officials discussing a plan ordered by the Crown Prince Bin Salman, to capture Khashoggi from his home in Virginia. On 2 October 2018 CCTV showed the “Tiger Squad” – suspected agents entering the consulate around noon. Khashoggi arrived about an hour later, accompanied by his fiancée Cengiz. He entered the consulate, through the main entrance, at around 1 pm. As he had not come out by 4 pm, even though the working hours of the consulate were until 3:30 pm, Cengiz contacted the authorities, phoning Khashoggi’s friend, Yasin Aktay, an adviser to President Erdogan, reported him missing and the police then started an investigation. According to numerous anonymous police sources, the Turkish police believe that Khashoggi was tortured and killed inside the Saudi consulate in Istanbul by a 15-member team brought in from Saudi Arabia for the operation. One anonymous police source claimed that the dead body was “cut into pieces” and quietly moved out of the consulate and that all of this was “videotaped to prove the mission had been accomplished and the tape was taken out of the country”. One source suggested Mr. Khashoggi’s remains were discovered in the garden of the Saudi consul general’s home. Middle East Eye cited an anonymous Saudi who said the Tiger Squad brought Khashoggi’s fingers to Mohammad bin Salman in Riyadh as other evidence that the mission was successful. Mohammad Tahir Khan Dawar was a Pakistani police officer and a Pashto poet who was abducted from Islamabad on October 26, 2018, and then tortured and killed. His body was found on November 13, 2018, by the locals in the Dur Baba District of Nangarhar Province, Afghanistan, close to the Torkham border crossing. His postmortem report revealed he had no marks of bullet injury but was rather killed by excessive torture during captivity. When the news first appeared, it was clearly stated his family was concerned as he had texted them (reportedly in English when he usually texted home in Urdu) on the day of his disappearance not to worry and that he’d be back soon, before switching off his mobile. On Oct 28, one of the top prime ministerial aides and his spokesman, Iftikhar Durrani, literally laughed away a VoA journalist’s questions regarding the missing police officer after saying Tahir Dawar was ‘safe and sound’ in Peshawar and rubbished his kidnapping report. On 13 Nov 18 more than two weeks later, one heard of the officer’s badly tortured and broken body being found in Afghanistan’s Nangarhar province which borders our Mohmand and Khyber agencies and is situated near the Torkham crossing between the two countries. 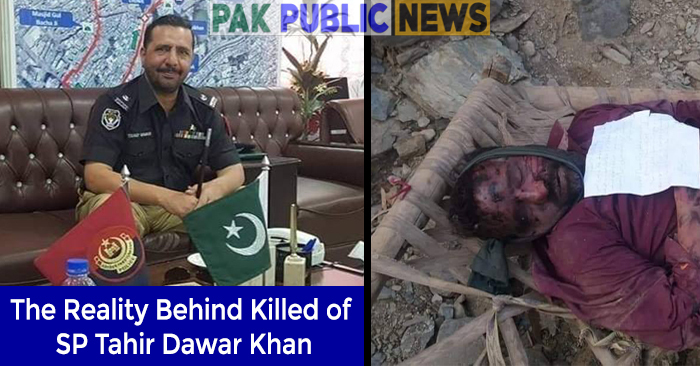 On Nov 14, Pakistan’s Foreign Office confirmed his death and govt announces Rs 70 million cash and job for heirs of slain police officer Tahir Dawar. Pashtunkhwa Milli Awami Party‘s leader Mahmood Khan Achakzai equated the murder of Tahir with Jamal Khashoggi, saying “both incidents required international probe.” Awami National Party held protest rallies in several cities across Khyber Pakhtunkhwa and backed the demand of PTM to call for an international inquiry. Pakistan Muslim League (N) and Pakistan Peoples Party criticized the government of Pakistan for failing to provide security to Tahir in the capital Islamabad. Did his support for PTM scare the establishment so much that his tortured dead body was planted across the Durrand line? Yes, Dawar’s open support to the Pashtun Movement was a source of embarrassment for Pakistan’s security establishment. Since no disciplinary action against him was possible given his impressive credentials, the only convenient way to silence him was to kill him and blame someone else. The most persuasive hypothesis is that Dawar’s torture and murder took place on Pakistani soil and then his dead body was somehow taken across the Durand Line to discredit the Afghan government. Murder of Dawar shows there are elements capable of surveillance, kidnapping from centre of Islamabad, detention for two weeks before transporting victim either dead or alive across two provinces, tribal areas and into Afghanistan without being noticed as security cameras fail. A year after escaping assassination by uniformed, armed guys in Pakistan, Pakistani journalist Taha Siddiqui in his latest article titled “I’m a journalist who fled Pakistan, but I no longer feel safe in exile” published in The Washington Post, has opined that in spite of residing in a self-imposed exile in France he fears for his life. The U.S. intelligence officials told me they believe that, after Jamal Khashoggi’s killing, repressive regimes such as the one in Pakistan have been emboldened to silence critics, not only at home but also abroad. Siddiqui said that numerous of his well-wishers have warned him of speaking against Pakistan Army, else it could be a repeat of Khashoggi and Dawar’s cold-blooded murder in his case. The Chinese autocracies have pioneered the practice of abducting and murdering domestic opponents even when they seek sanctuary abroad. And this is what has probably rubbed on to Pakistan now. Taha fearing for his life is understood because these establishments, be it Chinese, Saudi Arabia or Pakistani are averse to criticism. Democracy is a farce and is totally despised is a known fact. Saudi Arabia ranks 169 out of 178 countries for free expression, according to the 2018 World Press Freedom Index. These governments have been given free rein to continue silencing the media at an increasing rate. There was a time when journalists believed the Internet would liberate information from the censorship and control associated with print media. But these governments, whose very existence relies on the control of information, have aggressively blocked the Internet. They have also arrested local reporters and pressured advertisers to harm the revenue of specific publications. Hundreds of journalists have lost their jobs in recent months because of a financial squeeze that many believe has been orchestrated by the Pakistani authorities to teach independent media houses a lesson. With physical attacks and disappearances, fear has taken over, resulting in unprecedented self-imposed censorship by journalists in Pakistan. A recent survey revealed 88 percent of Pakistani journalists exercise self-censorship. This is a sad state of affairs. Pakistan’s powerful and secretive security establishment has long used abductions to silence anyone who dares to question and expose their actions. This matters, of course, for ordinary Pakistanis, who can’t speak freely about their government. It also affects lawmakers, whose ability to craft legislation is hampered by the lack of information. Media siege at this level encourages a climate of impunity against journalists in the country. But the regular threats and disappearances have real consequences for the rest of the world as well. An independent international platform, isolated from the influence of nationalist governments spreading hate through propaganda, ordinary people would be able to address the structural problems their societies face. This needs immediate attention before many more Khashoggi’s are sacrificed. WHY IS CHINA VULNERABLE TO TERRORISM IN PAKISTAN?